A commercial crew aboard the deep space towing vessel, Nostromo is on its way home when they pick an SOS warning from a distant planet. What they don't know is that the SOS warning is not like any other ordinary warning call. Picking up the signal, the crew realize that they are not alone on the spaceship when a alien stowaway is on the cargo ship. Scenes in red appear only in the 2003 Director's Cut. Scenes in blue appear only in the 1979 Theatrical Edition. The opening credits appear in front of a large planet with rings. Cut to the far reaches of deep space: the Nostromo, a commercial towing space vehicle, carrying a refinery with twenty million tons of mineral ore, is en route to Earth with a crew of seven. Inside, the ship appears eerily quit, but suddenly, the onboard computer is activated. Lights inside the ship are activated, and a room with 7 biobeds is illuminated. The canopies open to wake the crew. Executive Officer Kane (John Hurt) is the first to get out. They congregate in the mess hall, where they cheerfully enjoy a meal. Chief Engineer Parker (Yaphet Kotto) and Engineering Technician Brett (Harry Dean Stanton) take the opportunity to discuss the bonus system, which they find unfair, as they get paid less than the officers. Captain Dallas (Tom Skerritt) is called away by Mother, the ship's computer, before they can have a meaningful conversation. Dallas enters the Mother console room, and tries to assess the situation, as the rest of the crew gets in the cockpit of the ship to determine their location. They quickly deduce that they are not home yet. Navigator Lambert (Veronica Cartwright) finds out that they are at Zeta II Reticuli, and the ship is still quite far from Earth. When Parker and Brett return from their round of the lower deck, complaining about their colleagues' attitude and the bonus system, Dallas briefs the crew: the ship is not even halfway home, and has altered course because it has picked up an unknown signal, which repeats every 12 seconds. The crew has been awoken from cryosleep to investigate. Parker protests, arguing that they're not a rescue team and that they should be compensated for the extra work, but Science Officer Ash (Ian Holm) stipulates that per Company contract, the crew is obliged to investigate every signal from an intelligent source; non-compliance will result in loss of pay, which quickly gets Parker in a cooperative mood. The crew assembles in the cockpit to listen to the signal. It sounds very strange and unearthly, perhaps like a voice. Lambert homes in on it and finds that it comes from a planetoid, 1200 km in diameter, with a 2 hour rotation and some gravity. The Nostromo approaches the planet, which is close to one enormous ringed planet and two smaller ones. The ship separates from the refinery, and sets course to the planet's surface. It descends toward the planet, but the landing is rough, causing damage that will take some time for Parker and Brett to fix (although they allot themselves copious amounts of time). The planet is windy, and visibility is low. As the source of the signal is 2000 meters away and the sun is coming up, Dallas and Kane decide to investigate on foot. A reluctant Lambert is ordered to join. Ash takes place behind an outer window with a communication console, as the team puts on the space suits and leaves the ship to investigate the signal on the planet's windy surface. In the meanwhile, Warrant Officer Ripley (Sigourney Weaver) has gone to the lower deck to inspect the repairs. Parker and Brett ask if there will be a bonus for any discovery which is made on the surface; Ripley assures them that the law guarantees them a share, before returning upstairs, as they keep teasing her. Outside, the team walks between the rocks, through the planetoid's inhabitable atmosphere. Inside the ship, Ash tells Ripley that Mother has not yet deciphered the signal; she volunteers to give it a try. Ripley accesses a console and starts working on the strange signal. Outside, the sun is up and they wind has laid down. The team clears the rock formation, and makes a fascinating discovery. Near the horizon, they see a derelict spacecraft of unknown origin. It is lying against the rocks, vaguely shaped like a horseshoe. Despite Lambert's hesitation, they approach it, losing contact with the Nostromo upon entering the massive ship through an opening at the side. Inside, they find hallways with walls textured like bones. At the end is an elevated platform. It carries the remains of an enormous alien creature in a large chair, now fossilized. Upon initial examination, there is evidence of some unknown trauma to its chest: its ribs are bent outward, as if it exploded from the inside. Lambert wants to leave. Kane then draws the others' attention to a large hole in the floor. Meanwhile, analysis of the unidentified transmission suggests that it is not an SOS, but a warning. Ripley wants to go after the search party, but Ash talks her out of it, reasoning that by the time she gets there, the search team will probably know what the signal means. Kane is lowered into the hole by means of a winch. He finds an enormous tube-like hallway down below, divided into sections and basins. He nears one basin, discovering thousands of leathery objects that resemble large eggs. He also discovers a strange light and mist covering the eggs that reacts when broken. He trips and falls into the pit, but is okay and moves in to investigate further. Kane touches one of the eggs, which seems to give a shriek. He illuminates the egg from behind with a flashlight and discovers movement inside. He grabs a pistol: a strange, spider-like organism is the resident. The egg has flaps on top, which open, revealing its insides. As Kane moves into for a better look, the strange life form inside suddenly leaps out, attaching itself to Kane's helmet. Ash is looking towards the planet's surface, when he sees Dallas and Lambert carrying the unconscious Kane back to the Nostromo. They enter the airlock and ask Ripley to let them in, while Ash waits at the inner airlock door to open it. They inform Ripley that an organism has attached itself to Kane's face. Ripley hesitates, citing quarantine protocol: for the safety of the crew, Kane should first be decontaminated for 24 hours before being brought on board. Dallas fears for Kane's life and orders her to open the door, but she refuses, despite Dallas trying to pull rank. However, Ash disregards Ripley's decision and lets them in. In the infirmary, Dallas and Ash cut Kane's helmet open: they find a spider-like creature attaching itself to Kane's face, with eight fingers, and a long tail wrapped around his neck. Despite his mouth being blocked, Kane is breathing heavily. Parker, Brett and Lambert observe through a window. Ripley joins them, and is angrily slapped by a furious Lambert for not allowing them to re-enter the ship; the men break the women apart. Dallas berates Ripley for disobeying a direct order, but Ripley furiously replies that she was just following the rules. Ash attempts to remove the creature from Kane's face with a pair of pliers, but it merely tightens its grip, and is holding on so tight that it will tear Kane's skin with it. Kane is examined with a sophisticated medical scanner, which shows that the creature has inserted a tube into Kane's throat and is feeding him oxygen. Ash deduces that since Kane is comatose and the parasite is feeding him oxygen, removing the creature may kill Kane. Dallas is willing to take the risk. Ash tries to cut off one of its legs with a scalpel, but a yellowish fluid pours out of the wound and begins to eat through the floor. Out of concern that the acidic fluid will breach the hull, the crew runs several floors downstairs, and find that the stuff's corrosive effects is neutralized after burning through several decks. Dallas says the substance resembles molecular acid, and Brett comments the creature must be using it for blood. 'Wonderful defense mechanism - you don't dare kill it', growls Parker. Dallas orders everyone back to their posts, as Kane is left in his coma to be tended by Ash. Parker and Brett resume their repairs, commenting that they should never have landed on the planet. As Kane's situation remains unchanged, Ash is collecting data on the creature. He is startled by the sudden presence of Ripley in the infirmary. She wants to know what he has found out yet. Ash can only confirm that the creature's skin is made up of polysaccharides, which it is slowly replacing with silicon to toughen itself up. Ripley then confronts him with his decision to let it aboard, ignoring the quarantine law; Ash defends himself by stating he temporarily forgot the fact that Ripley is the officer in charge when Dallas and Kane are away, and that he did it out of concern for Kane's life. Ripley replies that by allowing this, he has put all of their lives at risk, which is not appropriate behavior for a science officer. Ash coldly lets her know that he is perfectly capable to make that decision, and she should stick to her own job. Ripley leaves. Dallas is sitting in the Nostromo's escape shuttle, the Narcissus, listening to music, when he is called to the infirmary by Ash, because something has happened to Kane. The creature has detached from Kane's face on its own, and has disappeared. Dallas, Ripley and Ash search the infirmary, and find it when it suddenly drops from an overhead compartment on an unsuspecting Ripley; it appears to be dead, only showing basic reflexes. They take a closer look at it, and confirm it is dead. Ripley wants to get rid of it, fearing that it may become even more harmful when dead; Ash strongly disagrees, given the uniqueness of the specimen. He wants to take it back to Earth for more tests, as it is harmless now. Dallas shares Ripley's sentiment, but leaves the decision to Ash, to Ripley's amazement. Ripley tries to talk some sense into Dallas, who is unwilling to listen to her arguments, replying that he only runs the ship, and the science officer has the final word on all things scientific. Apparently, this is standard procedure nowadays, as per the almighty Company's regulations. Ripley asks if Dallas has ever worked with Ash before. Dallas mentions that he did five tours with the same science officer, but this person was suddenly replaced two days before the Nostromo left Thedus dock. Ripley admits she doesn't trust Ash, but Dallas responds that he doesn't trust anybody. He asks about the status of repairs, which are still underway, but appear completed enough to take the ship off. Even though Ripley does not recommend it, Dallas prefers to leave as soon as possible. After a successful take-off and despite some minor technical errors, the ship docks with the refinery and cargo in orbit. The Nostromo then resumes its course for Earth. The crew is back in the mess hall, bickering again about what to do with Kane. Dallas decides they will all get back into cryosleep. Lambert has calculated that it will take another 10 months to get back to Earth, which spoils their moods even further. Ash suddenly calls Dallas to the infirmary. Kane has awoken, still groggy but seemingly unharmed. He remembers very little of the event, but is starved and wants to eat. The crew decides to have one last meal before they re-enter cryosleep. During the meal, the crew is finally having a good time again, joking and enjoying the food. Kane is eating like he hasn't got food in ages, sharply observed by Ash. Suddenly, Kane begins to choke. After initially thinking he has swallowed something bad, the mood suddenly changes when Kane starts to groan and convulse violently. While he lies writhing and screaming on the table, the crew tries to aid and stabilize him, but his chest suddenly bursts, and a small snake-like alien creature erupts from his insides. It silently observes its surroundings. Parker moves in to kill it with a knife, but he is stopped by Ash. The creature screeches, then scurries away quickly, leaving the crew stunned and horrified. A quick search through the deck yields no results whatsoever. After a short funeral for Kane, where his body is jettisoned into space, the crew members split up into two teams to capture the small creature. Brett assembles a weapon similar to a cattle prod, while Ash rigs together a tracking device. Parker, Brett, and Ripley investigate one of the lower decks, finding that the power has been disrupted despite repairs having been finished. Picking up a signal, they think they have the creature cornered in a cupboard. They prepare to catch it in a net, only to be startled by the discovery that it is the crew's cat, Jones, who had found a quiet place inside the cupboard, and runs away. Realizing they might pick up the cat on the tracker again later, Parker sends Brett off to catch Jones. As Brett is searching for Jones, he finds a mysterious object resembling a shedded snake skin on the floor. He continues on to a hold housing one of the ship's landing struts, eventually catching up with Jones. A strange creature is hanging in the chains above him, seemingly observing him. As Brett tries to coax Jones out, the cat hisses when a huge shape drops down behind him. It is the creature, however now with four limbs, an elongated head, fully grown and towering over Brett. Brett turns around, and is mesmerized while looking at the creature opening its mouth, revealing a second set of teeth which quickly extends from the mouth, biting Brett in the head, and dragging him, bloodied and screaming, above into an air shaft. Ripley and Parker hear him and arrive just in time to catch a glimpse of the monster as Brett disappears and blood drips down. Parker and Ripley can only confirm the creature is big and escaped through the air ducts. Brett is assumed dead. The crew debates their next move. They all agree that the alien is using the air shafts to move around, so if they could drive it from the ducts into an airlock, they might be able to blow it out into space. Ripley asks Ash if he can offer some helpful information as a scientist; Ash suggests the alien may be afraid of fire, as most animals are. Fortunately, there are several flamethrowers on board. Ripley volunteers to enter the air shafts, but Dallas overrules her by volunteering himself. Dallas enters the Mother console once more. He tries to get the Mother computer to evaluate their procedure to get rid of the alien, but Mother simply cannot provide an answer, due to lack of input. He tries to get Mother to offer suggestions, but again, the computer cannot compute, due to lack of available data. Finally, Dallas types " What are my chances?" The computer replies that it cannot compute. The main airlock is prepared by Ripley and Ash for the decompression procedure, while Parker and Lambert position themselves where they can measure movement inside the ducts. The main duct is opened and Dallas enters the network of air shafts with a flamethrower, allowing the crew to remote-close valves behind him as he proceeds. Lambert uses a motion tracker to get his location, when she suddenly catches another signal going towards him. Assuming it is the alien, Dallas uses the flamethrower to make sure that one of the ducts leading down is safe. He ascends a ladder to the lower duct, but the alien's signal is lost in the meanwhile. He finds a puddle of slime on the floor. Lambert assures him that the alien cannot be far, so he uses the flame thrower around him to scare it out of hiding; nothing is there. Dallas is disoriented in the cramped space and starts to panic, when the other signal starts moving again, at higher speed to his location. Lambert desperately urges him to move away. He descends another ladder, turning around, his light illuminating the shrieking creature stretching its arms towards him. Static and feedback interrupt the line, and then there is only silence. Parker puts Dallas' flamethrower on the table, saying it was just laying in the duct: no blood, no Dallas. Lambert looks as if she is near a nervous breakdown, while Ripley is desperately trying to hide her apprehension. She suggests that in absence of a better idea, they should continue with the old plan. Lambert says it is madness, and suggests abandoning the ship with the shuttle; however, the shuttle cannot sustain four people. Parker also opposes the idea, and wants to kill the creature; even if this means entering the entire duct system again, and blowing the alien out of the airlock. He leaves to re-fill the flamethrower. Ripley once again tries to get helpful information from Ash, but he says he is still analyzing. She scoffs at him for being so little help, and decides to go and try Mother for answers, since she now has access in light of Dallas' absence. Ripley enters the Mother console, and queries Mother for answers as to why they are unable to neutralize the alien. Mother responds that she cannot clarify. Ripley asks Mother to explain that. Mother replies that she cannot, referring to 'Special Order 937' , which is only meant to be read by the science officer. Ripley uses a command override to force Mother to explain what Special Order 937 entails. Mother displays the following shocking text: 'Nostromo rerouted to new coordinates. Investigate life form. Gather specimen. Priority one: insure return of organism for analysis. All other considerations secondary. Crew expendable.' As she contemplates the cold, hard words, she suddenly finds Ash sitting next to her, saying there is an explanation for this. Furiously, she grabs and yells at him, sobbing uncontrollably. She leaves the console, trying to contact Parker and Lambert, but she finds that Ash is closing all doors leaving the mess hall, preventing her from leaving. She demands that he open the doors, but Ash simply stares at her. She notices a drop of white liquid running down his face, and he starts to have facial twitches. Unnerved, she tries to run away, but he suddenly grabs her hair; Ripley breaks free, pulling out a lock of hair, and tries to run. Ash quickly catches up and throws her against a few walls. While she is barely conscious, Ash uses a rolled-up magazine in order to choke her. She starts to struggle fiercely as Ash starts to twitch and make incoherent noises. Suddenly, Parker and Lambert arrive, both trying to drag Ash away from Ripley. Parker howls in pain as Ash grabs a piece of skin on his chest, forcing him to let go. Parker quickly grabs a fire extinguisher and hits Ash with it in the back. Ash starts to convulse and shriek violently, making very inhuman sounds while spitting out white liquid. Parker gives him another blow with the extinguisher, dislodging Ash's head, revealing Ash is an android. He keeps ponding Ash until he is on the floor, white liquid gushing from its insides. Ash' movements start to decrease and Parker settles down, but suddenly, the decapitated body grabs him and forces him onto a table; Lambert finally grabs the electric prod and screams as she stabs Ash in the back with it, finally rendering the android lifeless. With Ash disabled, Ripley theorizes that the Company sent him along to bring an alien back for their weapons division, as Ash was always very protective of the creature. They reconnect his disembodied head to see if he can give them any advice on how to deal with the creature. Ash confirms that his order was to bring back the life-form, even if it meant sacrificing the crew. Ripley asks how they can kill the creature. He tells them they have no chance against it, as it is "the perfect organism". He has a silent admiration for it, "a survivor, unclouded by conscience, remorse and delusions of morality". When he mocks their chances of survival, Ripley disconnects him again. The three survivors decide to follow Lambert's earlier suggestion; set the Nostromo to self-destruct and escape in the shuttle, leaving the Alien to die on the main ship. As they leave the room, Parker turns the flamethrower on Ash's corpse, melting his remains. Ripley will prep the shuttle for launch, while Parker and Lambert go to gather coolant for the shuttle's life-support system. While prepping the shuttle, Ripley hears the cat meowing on the ship's open intercom system, and realizes Jones is still left behind. Lambert and Parker are in the hold gathering equipment. They proceed to a small room where the coolant is stored. Ripley ventures out alone, into the hallways of the Nostromo to find Jones the cat. Expecting the alien at every turn, Ripley finally locates the cat in the cockpit, where he startles her as he suddenly jumps into view. She puts him into his traveling container. In the meanwhile, Parker and Lambert are working so feverishly on the supplies, that neither of them pays attention to a large shadow creeping into the room. It is the alien, and it closes in on Lambert. Ripley can hear Parker shouting orders to Lambert to get out of the way, but the alien has cornered her against the wall. Parker is unable to get a clear shot at it with the flamethrower without killing Lambert, as it is hulking over her. Finally, he charges at the creature, but it rapidly spins, whipping the flamethrower out of his hands with its long tail, and grabbing him with its large claws. The creature opens its mouth, and its bizarre inner jaws pierce Parker's head, instantly killing him. As Ripley rushes towards their position, she is powerless to prevent the creature from turning back to Lambert. It curls its tail around her, and the final thing that Ripley can hear from the intercom are the sounds of Lambert, crying, sobbing, gagging and screaming. Ripley finds their lifeless bodies in the storage room they had been working in, with no sign of the alien. In terrible shock, Ripley dashes towards the emergency room without stopping. Between the sobs, she quickly completes the entire procedure to activate the self-destruct mechanism. The voice of Mother now announces that the self-destruct mechanism has been activated, and the ship will detonate in 10 minutes; however, the self-destruct can still be canceled during the first five minutes. Ripley takes a ladder to the lower deck, where she hears a soft groan. She inspects the hold, and finds a strange organic structure adhering to the walls and machinery. Shocked, she finds Dallas stuck within the adhesive, barely alive. On the opposite wall, she notices a shape which vaguely resembles Brett; he seems to be dissolving, transforming into an object like the eggs seen in the derelict ship. Dallas very weakly begs Ripley to kill him. After some hesitation, she grants his dying request: she burns them both with the flamethrower and rushes out of the chamber. Ripley crawls up a ladder, and runs towards the shuttle with Jones in the container. She briefly rests against a wall, when she suddenly hears the alien stirring around the corner. Terrified, she drops the cat carrier and carefully retraces her steps, as the alien slowly comes into view around the corner. It shows interest in Jones. The alien slams the container against a wall. Ripley races back to self-destruct mechanism and tries to override the procedure; however, she is too late, as the mechanism is already starting to activate. She restarts the cooling unit, but Mother states that it is too late to stop the countdown, and the Nostromo will explode in 5 minutes, much to Ripley's anger. With sirens blaring and steam releasing, Ripley runs back to the shuttle loading area, ready to make her best attempt to fight off the alien and get into the lifeboat. The alien is nowhere to be seen, only the cat container lying on its side. As fires start to erupt, she picks up Jones and boards the shuttle with only one minute to abandon ship. She quickly runs through the launch sequence, and the shuttle lowers to launch position as Mother starts counting down the last 30 seconds of the Nostromo's life. The shuttle's engines ignite and the ship races away from the Nostromo, which grows smaller by the second. A series of mighty explosions follow as the Nostromo vanishes in fire, destroying the refinery and ore it had been carrying. Ripley is relieved it destroyed the alien along with it. Ripley gives Jones an hug and prepares one of the biobeds for cryosleep, putting Jones in it. As she makes final preparations for the ship, a hand suddenly reaches out to her from a wall; she shrieks, and in horror, she sees the alien lying in an alcove. It had, in fact, stowed away aboard the shuttle, its external physicality making it blend in with the ship's machinery. She flees into a locker with space suits inside, and notices the alien is not following her; it remains lying in the alcove, seemingly unable to do something. Ripley gets an idea, and dons one of the spacesuits. She arms herself with a harpoon gun, then straps herself into a chair while singing 'You are my lucky star' to calm her nerves. 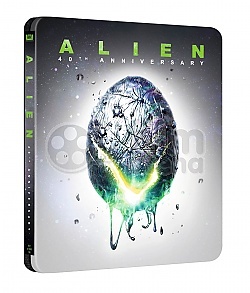 Opening a series of air vents above the alien's head, Ripley tests them one at a time, and then finds one that directly blasts high-pressure steam onto the alien, driving it screaming from its hiding spot. As she is activating several buttons, she doesn't notice the monster creeping up to her from the side, until it is standing next to her to its full, menacing 2-meter height, ready to attack with its inner jaw. Screaming, she opens the shuttle's airlock door. Everything not secured, including the alien, blasts towards the door. 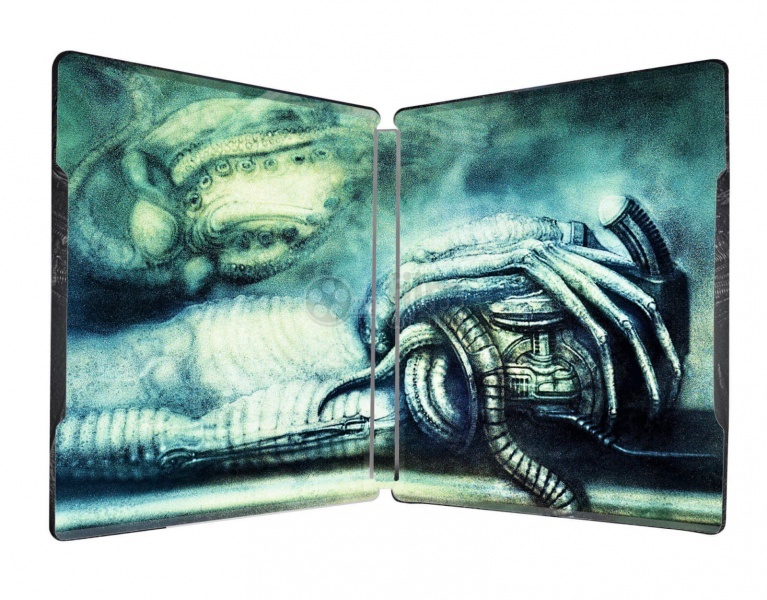 The alien, however, grabs the edges of the doorway to prevent itself from being sucked outside. Ripley quickly fires her harpoon before the creature is able to haul itself in; it pierces the screaming alien, which lets go of the doorway and blasts outside, the wire connecting the gun to the harpoon pulling the gun out of Ripley's hands. However, the door slams shut, jamming the wire under it. Still tethered to the door by the wire, the alien undauntedly attempts to re-enter the ship by climbing inside one of the heat thrusters. Ripley, however, sees the opportunity and fires the engines, incinerating the alien, and sending it drifting into space. Before she and Jones enter hypersleep for the trip home, Ripley records a final log entry, stating that Kane, Lambert, Parker, Brett, Ash and captain Dallas are dead. Cargo and ship are destroyed. She expects to reach the frontier in six weeks, and to be picked up by the network. She signs off as Ripley, last survivor of the Nostromo, and gets into hypersleep.